Ride Out Ride On – RORO for short – is an inclusive cycle outreach service for adults and children with disabilities. Based in Bristol. RORO’s aim is to bring the joy and freedom of cycling to those who, through disability, stroke, or mobility issues, would otherwise be unable to go out for a ride. For many clients, cycling has always played an important part in their identities, or their means of getting exercise, and part of RORO’s mission is to help people who, for whatever reason, have lost their ability or the desire to ride to re-find the love of cycling, and re-introduce it to their lives. For others, the prospect of riding a bike, and the confidence, strength and wide-eyed enjoyment it can bring, may be a new prospect. 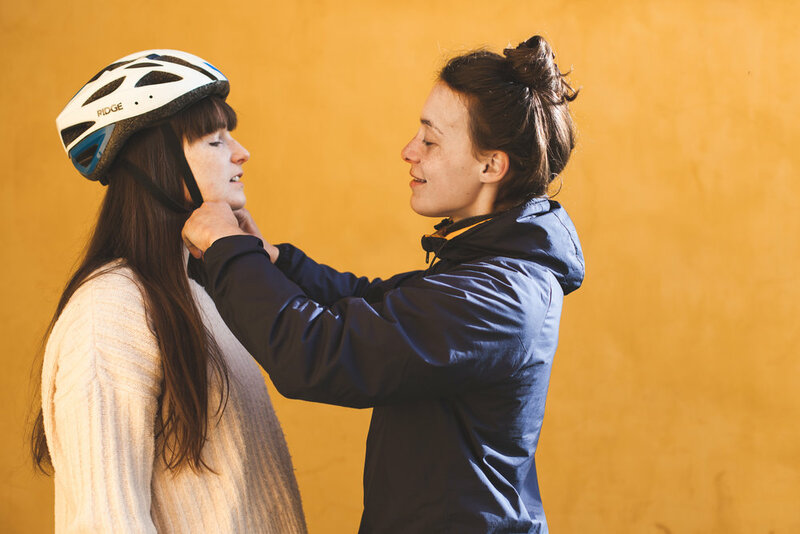 In either case, RORO’s cycle out-reach service is about bringing riding to those who would otherwise be unable to ride themselves – and to open up for them all the life-giving, life-affirming benefits cycling can bring. The tandem we use – the Hase Pino - is specifically designed to open up the world of cycling to as many people as possible, irrespective of their strength, their balance or their confidence. Clients are placed on the semi-recumbent front seat, and add what power they want to, or are able to, using the front pedals. The steering, gear shifting and braking are all controlled by the rear rider, allowing the client to enjoy the movement of the bike, and the freedom of the ride, without having to be responsible for the control or navigation of a moving vehicle. RORO has developed a bank of traffic-free, and low-traffic routes in and around the Bristol area. By arrangement, clients can either be met at a home address or at the start of the chosen route, or if a more ambitious trip is planned, clients can also be picked up by car and taken, along with the tandem, to the chosen destination. If preferred friends, partners or carers or are also welcome to come along for the ride – if not, the tandem is designed to place the heads of both riders close enough together to allow free-flowing conversation – so those yelps of delight that getting on a bike inspires won’t go unheard. Tailor-designing the route and the set-up of the bike is at the heart of the RORO’s service. The needs placed on the bike, and the routes taken will vary with every client, and for this reason, an introductory meet-up always forms the first RORO session. The tandem will be set up in accordance with the client’s height, and any other adjustments can be made to the bike – the addition of a leg support brace for those with reduced strength in one or both legs, or the shortening of the pedal cranks in the case of children, for example. From there, the client will be asked how far, and for how long they will want to ride for, whether they want to be Bristol-bound, or whether they want to venture further afield, and after that, the first proper RORO session can be organised – and the real fun can begin.